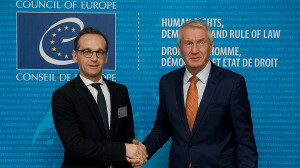 The German Federal Minister for Justice and Consumer Protection, Heiko Maas, today paid an official visit to the Council of Europe in Strasbourg and held talks with its Secretary General, Thorbjørn Jagland. The items discussed included combating online hate speech and incitement to hatred, and the fight against discrimination and racism. In addition to Secretary General Jagland, Minister Maas met the Council of Europe Commissioner for Human Rights, Nils Muižnieks, and members of the Parliamentary Assembly of the Council of Europe. At the close of his visit to the Council of Europe, Minister Maas visited the European Court of Human Rights.